You have access to thousands of e-books via the ICOM Library's databases. Feel free to search through or browse these below. The ICOM Library also has a limited print collection which includes copies of most of the required textbooks and other books that support the learning needs of our students. Use of the catalog to search for ICOM Library books (both online & in print). Access Pharmacy includes over 80 e-books related to pharmacology, pharmacy practice, toxicology and more. ClinicalKey provides access to over 1,600 full-text medical books. You will need to create a free account to download PDF copies of the book chapters, and CK limits downloading to 2-3 chapters/book. This collection includes 35 e-books all focused on first-aid, test/board prep on first aid issues, and related works. You can download and save PDF copies of the entire book. The LWW Health Library includes nearly 40 e-books covering a wide range of topics. This is where you'll find the core osteopathic textbooks and Bates' Guide to Physical Examination. 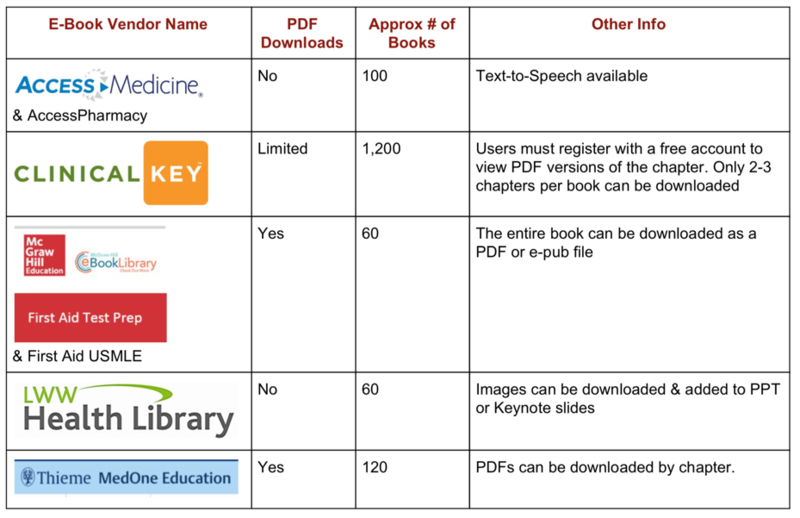 MedOne provides access to over 90 e-books in the areas of anatomy, basic and clinical sciences, and radiology. The entire books can be downloaded and saved.